Just before the release of the new ARAM map we started our 1v1 tournament for the players at work. 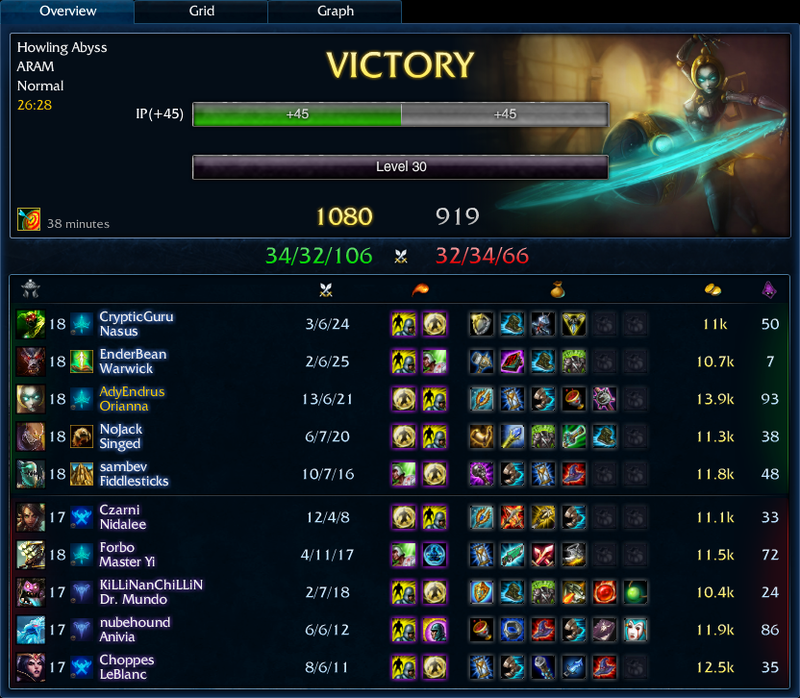 Every night, either before games or after, we played an in-house ARAM or two. This has really helped support the tournament because if someone comes out just for the ARAM they still cheer their co-workers on. Last night we had an exceptionally close and exciting game that qualified for a blog post. In Champion Select I saw that Choppes got LeBlanc. This definitely caused some worry on my team, as they had seen LeBlanc and knew what she was capable of. He was already feared as the best player on the enemy team, and now he had a champion that he could really make work in an ARAM. To make matters worse (for my team) they also had two of the absolute best picks for ARAM; Master Yi and Nidalee. But that’s not all! Wait, there’s more! They also included two champions who work super well in ARAM thanks to their poke! They had Mundo Cleavers and Anivia Flash Frosts in their arsenal as well. Sounds like this is gonna be a fun game! Sambev and myself quietly hid behind our tank front-line of Nasus, Singed, and Warwick (which is a pretty nasty nightmare for most squishies) and waited for our time to strike. Our whole strategy revolved around Fiddle ulting into a team fight, I would throw my ball on him, and then I’d flip the whole team and keep them locked in his ultimate. The first time we put this strategy to use was very effective. Fiddle surprised most of the enemy team, my ball was already on him, I just pressed R and Shockwave worked its magic. We quickly melted three people on the enemy team, and turned the game around in our favor. Then we realized the sad, sad truth about our ultimate combo. Fiddlesticks ultimate cooldown was our bottleneck. We would have to wait for his ultimate to be available before we could effectively team fight again. We basically had to turtle down and get picked on and poked at. If I tried to place my ball in the bush for vision I would get bursted down by LeBlanc, be forced to use Command: Protect on myself, and I would have achieved nothing. We were waiting for Fiddlestick’s ultimate, and then we’d be fine. The second attempt at our strategy was bad. I won’t say OK, I’ll say bad. I had my ball on him, but by the time he went there was no one to flip with Shockwave. We scared the enemy team off for a bit. It seemed like we hit a patch of bad luck, because the next couple of ultimates from Fiddle were less than productive. There was actually one where he started channeling his ultimate and Nidalee landed a max-range spear to finish him off. Sadness! In the downtime we managed to perform a fairly effective combination that used Warwick as the proxy for the ball carrier. It worked once or twice that way. One time we did it and Fiddlesticks was waiting in the wings, so the team collapsed on Warwick, I flung everyone around and Sambev flanked in from the side. It was pretty spectacular to not suffer any counter attack because the team is watching their health bars evaporate. When the game went late we had a perfect shot to close up the game. Sambev channeled his ultimate, and popped out on four members of the enemy team. I had Orianna’s mechanical ball on him, so I bounced the enemy team as they tried to escape from the horror of Fiddlesticks’ Crowstorm. The damage was massive. People instantly melted. Only Nidalee escaped. It was a close game that we won using teamwork. Sambev was thrilled to have a positive KD in a game that he ended up winning. Choppes hopefully learned not to try to burst the person with Zhonya’s on the enemy team when playing LeBlanc. You think I don’t see that burst coming? I think Choppes only had five of my six deaths.